if only you wanted to." Jesus felt sorry for the man. So he put his hand on him and said, "I want to! Now you are well." he sent him on his way. He said, "Don't tell anyone about this. Just go and show the priest that you are well. and everyone will know that you have been healed." The man talked about it so much and told so many people, that Jesus could no longer go openly into a town. but people still came to him from everywhere. May we be inspired by our Founders to be the best that we can be. 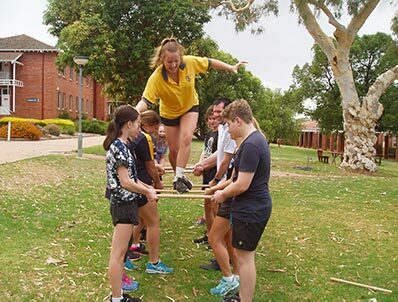 Our Secondary Student Leaders spent two days at their Leadership camp over the last week- end. I was most impressed by their enthusiasm and commitment to service and I thoroughly enjoyed spending time with them on camp. Thank you to Mr Vernede and Mrs Parnham who gave of their free time to organise this activity for our students. Our Community Mass will be held this Saturday 10 February at 5.30pm at the St Joseph’s Parish Church. Afterwards, there will be a sausage sizzle for our visitors hosted by the P&F Association on our Secondary Campus. We invite all our students and their families to attend and we look forward to seeing many of you there. Students in Sacramental years are able to bring their Commitment forms to this Mass. Do bring your families to this important community gathering. The first of our scheduled Parent evenings were held this week. Thank you to the parents who were able to attend. Students in Years 11 and 12 can access the Power- Pointpresentations through their School login and Teams. Parents are encouraged to view these PowerPoints. Please refer to the Parent Calendar for upcoming evenings for each year group. Next week’s schedule will include Years 9 and 10 as well as the Primary classes. We look forward to having you join us. We are a School blessed with a committed group of parents in our P&F Association. 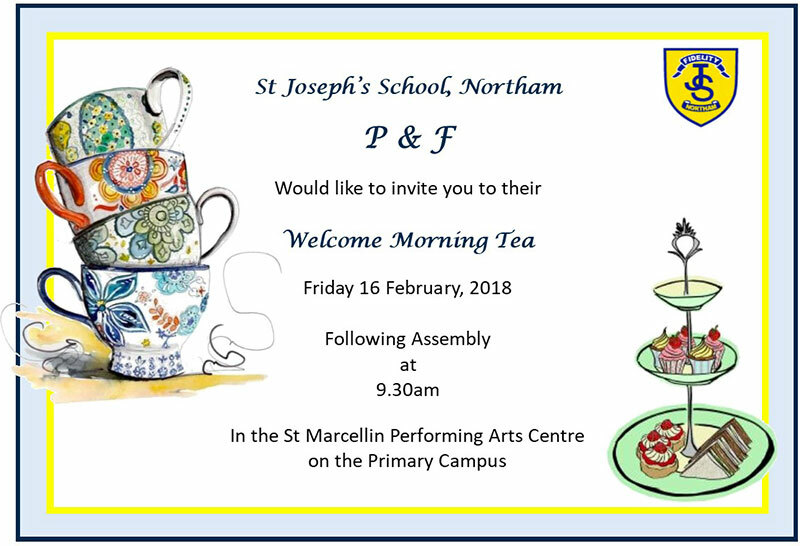 We invite all our families to a welcoming (and yummy) morning tea on Friday 16 February at the St Marcellin Performing Arts Centre following the Primary Assembly. You will meet other parents and some of our staff. Our Assembly will start at 8.55am (after Class roll call). Do come and have a cuppa with us. Our Annual School Improvement Plan for 2018 will be available at the parent information evenings. Electronic copies are available from our website. Thank you to those parents who returned all the information forms which are a necessary part of running our School and ensuring that your child's information is up to date. If you are yet to return your forms, we would appreciate them returned to your child's teacher by Monday 12 February. At this time of year we have many students and new families becoming acclimatised to the trip to a new school and so we have added congestion to our limited road space. All families are reminded that road safety is an important priority at the start and end of each day. Parents on the Secondary Campus are reminded that the Church carpark has a 10km speed limit and that all traffic should follow the arrows. Cars leaving Duke Street exit are reminded to pay particular attention to the buses using the designated bus bays. Parents on the Primary Campus are reminded of the need to use to Kiss & Ride without leaving their vehicles. Ifyouwishto park, you should only do so in designated parking spots that do not infringe on the private property of our neighbours. The Shire Rangers have advised us that cars illegally parked, including parking on verges or footpaths, may receive infringe- ments. We ask that you opt to park that little bit further away so that you can park legally and safely walk with your child. At the start of every year, students are expected to wear the School Uniform in a well-presented manner, at all times! As a School, we encourage students to feel especially proud by wearing the school uniform correctly and in a manner that shows school pride. Please refer to the Parent Handbook for any information regarding uniforms. The Uniform Shop opening times are listed at the back of the newsletter. All parents and visitors must sign in at the Office before engaging in any activity or if a student is picked up or dropped off outside normal school times. Parents are requested to arrive no earlier than 3.00pm [Mondays, Tuesdays, Wednesdays and Fridays] or 2.25pm [Thursdays] when collecting a student at the end of the day. Similarly, parents are expected to depart the school grounds in the morning at the ringing of the bell or when the siren goes. It can be disconcerting to a child adjusting to the new routine if they can hear their parents chatting outside their classroom. With many new students, there may be parents who are unfamiliar with our absentee procedure, namely, you must call the Primary or Secondary office prior to 9.00am on the day to notify us of your child’s absence, otherwise you will receive a text message from the School advising of an unexplained absence. Our telephone system allows parents the opportunity to call and leave messages outside of normal office hours, if this is more convenient. Alternately, you may send an email message to our new email address: absentee@sjsnortham.wa.edu.au to notify of an absence. This email will then take the place of written notification. If you would like to contact the School or an individual teacher, please ring the Office at either campus to arrange an appointment with the person you would like to see. The School Diary is also another means of communication for students from Years 3 to 12 and should be used to record homework and brought home every day. Par- ents are encouraged to check the Diary daily. Students in the younger years will be using a Communication Book which will have letters and/or notes from teachers stuck in. As with the Diary, parents should refer to this Book daily and can use this as a means to notify their child’s teacher of any concerns or absences. On Wednesday 14 February, parents with students in classes from Pre Primary to Year 6 are invited to an information session. We will commence at 5.30pm in the St Marcellin Performing Arts Centre with a presentation from Mrs Cox. At 6.00pm, teachers will conduct their own information session in their classroom and this will run for half an hour [Session 1]. At 6.30pm, each teacher will repeat their information session [Session 2], so as to allow parents the opportunity to attend two classroom information sessions if you have more than one child at Primary. If you only have one child in PP to Year 6, then you will be able to leave after Session 1. We are trialling this process for the year and welcome your feedback. Homework classes will commenced this week on Tuesday with the timeslot 3:15pm-4:15pm. Students wishing to attend these classes must have their parents/guardians complete the Permission form before they can attend these classes. These forms are available from the Secondary Admin Office. 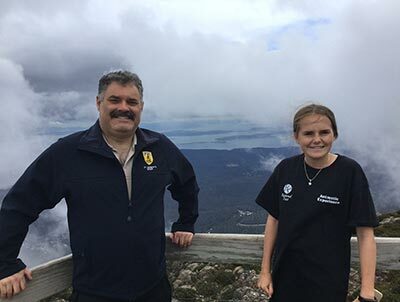 A short report is provided here from our intrepid adventurers, Jelena Manuel and Mr Gargano, as they are currently participating in the ‘Antarctic Experience’ in Tasmania. “A hectic day going through the AAD, listening to presentations, investigating the research in the labs, which included work on algae, krill (both in the wet lab and it was! ), electronics and robotics as well as a live Q & A session with scientists and engineers at Casey Station. Jelena was lucky enough to meet and chat over breakfast with the Scientist that she did her assignment on, Dr Dana Bergstrom, as well as being invited to meet the Director of the AAD, Dr Nick Gales. Both made a special effort to attend for a brief time and Dana especially came over during breakfast to meet with Jelena. We were fortunate to include a trip up to Mt Wellington where it was 12 degrees. Tomorrow, it is the Institute for Marine and Antarctic Science. The 2018 Student Leader Camp was a great success. The camp concluded with the general consensus being that most of the students enjoyed the activities, team building exercises and experiences that were offered. We would like to start by thanking the staff who organised the camp, Mr Vernede and Mrs Parnham, for the effort they went to. It made the experience a great one for all the students. I would also like to thank Mr Thompson for preparing the amazing lunch on Sunday for all the students - it was enjoyed very much. A big thank you to Mr Patterson who gave up his time to drive the bus to and from the camp - again, it was much appreciated. We would like to thank our fellow student leaders who made the camp an even greater success. It was an honour to have those two days to get to know the other student leaders for the great people they all are. The attitude and determination of all the student leaders made the camp an enjoyable and fun event to be a part of. The camp being such a success meant that as a group, the student leaders have had more than ample opportunities to become a stronger student leader body. We had our first student leader meeting, in which we discussed projects and plans for the year to come. Another huge success and a good highlight from the camp. This first meeting gave us an opportunity to speak out about what we want to make different or better this year. As a group, we also had the opportunity to conduct our first meeting with Mrs Cox, for which we would like to send a formal thank you for. The student leaders felt that this was a very important moment. It was an opportunity to tell Mrs Cox our plans for the year and also highlight what type of leaders we aspire to be. This meeting we feel was an important stepping stone in starting our 2018 journey. Throughout the camp, the student leaders completed a number of activities and team building exercises designed to bring us closer together as a group and create a sense of trust for each other. We believe, as the School Captains, that these activities brought us together as a stronger and more confident group of leaders. Overall, it was evident that the group were always willing to work together and find a solution or a way through the problem and a sense of trust and stronger friendships were definitely created within the group. We believe that as a result of having such a successful camp, the 2018 student leader body are fully prepared to deliver and work together to make 2018 an amazing and memorable year. All students are required to wear their allocated House shirt, St Joseph’s Sports short and appropriate footwear when they are scheduled for PE classes. Students are permitted to get changed in the break time before and after their allocated sports lesson. As per the School Uniform Policy, no student is to arrive at or leave from School wearing their sports uniform. Without the correct sportswear, students are not permitted to participate in the PE lesson or activities and will be required to complete written work instead. Parents/Guardians who hold a Centrelink Family Health Care Card, Centrelink Pensioner Concession Card or Veterans’ Affairs Concession Card who have students in Years 7-12 can claim an allowance. Note: Card held must be current in first term of the school year. To apply for the scheme or to obtain more information, please arrange to see Mr Steve Johnson at the Primary Campus. Applications close 31 March 2018. The full year’s School fees will be issued within the next few weeks. Unless you are paying by Direct Debit (DD) or another regular payment scheme, the School requires payment of at least 1/3rd by Friday 9 March. Those parents on the HCC/PCC Scheme must visit or contact the Primary Office prior to Friday 16 February so discounted fees can be calculated and the Secondary Assistance Scheme (SAS) Rebate claimed (if applicable). 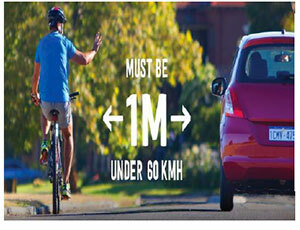 RoadWise Reminder ~ School 40km/h Zones! We would like to remind the community that as schools resume this week school 40km/h zones will apply. Help us keep our children safe by slowing down and not being distracted while driving. The penalty for contravening the law is $400 and 4 demerit points. The 2017 National Primary School SunSmart Survey revealed many adults do not wear a hat whilst outside during daylight hours. Wearing a hat when you’re outside should not be difficult. It’s important for your own health and crucial in passing on health messages to children. If Western Australia’s high rates of skin cancer are not enough to convince adults to wear a hat, here are two more reasons. Ultraviolet (UV) radiation from the sun is a class one carcinogen and causes skin cancer. This means UV is a foreseeable harm. model, your example will encourage kids to keep wearing their hats too. Kids copy the people they look up to and will be more likely to wear a hat during and out of school hours if their role models wear one too. Reduce your personal risk of skin cancer, contribute to a safer work environment and show the kids that hats matter all the time. They will thank you for it later. The Aussie Hoops basketball program for 5-10year olds will be running during Term 1 in 2018. These sessions will run on Tuesday afternoons from 4.30-5.30pm. The season will run for seven weeks commencing on 6 February. Please register at http://www.aussiehoops.com.au/ For more information contact Rhonda Oliver on 0403 537 586. Looking for something for the kids to do? Try Scouting! Northam Scout Group invites girls and boys aged 6 to 17 years to come and try scouting. You get to try for a few weeks before joining. Joey Scouts (ages 6-7.5) meet from 3.30-4.30pm, Cub Scouts (ages 7.5-11) meet from 4.45pm to 6.15pm, and Scouts (ages 10.5-14) and Venturers (ages 14.5-17.5) meet from 6.30pm to 8.30pm. We meet on Thursdays during school term at Northam Guide Hall, 46 Burnside Avenue, Northam. For more information about Northam Scout Group, and to register your interest, please contact Group Leader Amanda Abbott on 0409 206 607 or email Amanda on gl.northam@scoutswa.com.au. Training Sessions and games are held on Fridays from 5.00pm- 5:50pm at Northam Recreation Centre. Term 1 dates are 9 February to 23 March and is open to students aged 5-14. Mouth and Shin guards are compulsory! For further infor- mation, please contact Tash James on 9574 0543, email: tashjames12@hotmail.com or text 0428 109 642. Now is the time to register your interest to be involved with the Avon Youth Girls Competition in 2018. We are calling all players, coaches, volunteers and officials who would like to register their interest in this competition. All you have to do is use the link address below and it will take five minutes to complete: (this link will remain open until 31 March 2018) https://membership.sportstg.com/regoform.cgi?formID=75116 Please note: girls as of 2018 must be in Years 7 to 12. There is an option to select what club the player would like to play for: Northam, York, Bindoon or Kellerberrin/Cunderdin are listed as the options. If a player is from another town not listed, just click on one of the teams to register your name. All players must register as a child on the first page of the link. (child = under 18 years of age). Enquiries to Glen Collins Midlands Regional Manager, West Australian Football Commission, on 9690 2439 or 0417 920 817. Fish fingers will be available to purchase at the price of $0.50c each for lunch on Ash Wednesday and each Friday during Lent. These are optional items during Lent and our usual menu will be available. We look forward to seeing many of our families in the Canteen again this year and ask that you return the Canteen Helper form distributed to students this week as soon as possible. We will contact families to set up our roster for the Term. All assistance is greatly appreciated even if you only have an hour to offer.